The future of one of Edinburgh's most iconic landmarks, which has been left empty for 50 years, will be determined with a public inquiry later this month. 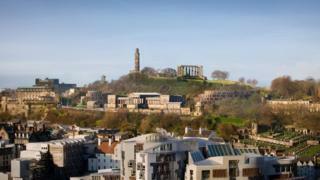 The decision over the former Royal High School at Calton Hill will be made by Scottish government reporters. Developers want to transform the site into a luxury hotel but their applications have been refused. Campaigners have backed a rival scheme that would see the site become a new home for St Mary's Music School. Scott Ferrie and Dannie Onn have been appointed as the two reporters by the Scottish government for the six-week inquiry, which will begin at Heart of Midlothian's Tynecastle Park stadium on Tuesday 18 September. The inquiry is set to cost at least £6,000 a day, with more than 350 documents to sift through and 25 witnesses expected to be called. The are also appealing the council's initial refusal to grant planning permission in December 2015. An alternative plan to develop the site for St Mary's Music School was given the green light in 2016 with a seven-year expiry date on consent due to the unique situation with the hotel plans being appealed. Despite the approval of the music school plans, St Mary's currently has no right to the building because of an agreement between the council and the hotel developers, which is understood to run until 2022. Duddingston has opted for a full public inquiry, enlisting lawyer Ann Faulds and Gordon Steele QC, who was employed by President Donald Trump in legal battles over his Aberdeenshire golf course. David Orr, co-founder of Urbanist Hotels said: "We are progressing with the appeal because we are wholly committed to bringing a world-class hotel to the Old Royal High School site - in line with our contractual agreement with City of Edinburgh Council. "We are confident that the appeals process will allow many of the complex technical issues raised with both previous planning applications to be considered thoroughly, with due consideration of the substance and detail of our proposals and the expertise of our teams. "Put quite simply, it is the right forum to discuss such a complex and emotive issue." The music school plans have won the backing of a host of high profile artists including author Alexander McCall Smith and television presenter Alexander Armstrong. Mr McCall Smith said: "This building is of immense importance to Edinburgh and the entire country. "It is not something that should be lightly turned from a unique treasure into yet another hotel. It is a public building. It must be used for the benefit of the nation." The first part of the inquiry will deal with the heritage impacts of the proposals, and is expected to last up to four weeks. The second section of the inquiry, focusing on the tourism and economic benefits could take another two weeks. The concept of turning the building into a hotel won a council-run design contest eight years ago, but the plans faced a backlash from campaigners after it emerged the proposals included multi-storey extensions. The revised plans reduced the number of hotel rooms from 147 to 127 and lowered the extensions.